Begin by preparing your barbecue. Light the coals and wait until they’re covered in a fine layer of ash, then bank them to two sides of the barbecue. Place a container of water in between them – this may need refilling during cooking. If you like, tie the wings to the side of the body and pull the legs together with butcher’s string. Smear the bird in half the butter, squeeze the lemons over it and place the lemon halves in the cavity with the thyme and rosemary. Season the bird well with salt and pepper, inside and out. Place on the grill and cover. You need a decent amount of air circulating, so the vents in the barbecue lid should be three-quarters open. If you have an oven thermometer, you want the temperature to remain at a relatively constant 180C. Make a simple basting sauce by melting the rest of the butter and stirring in thyme and rosemary. Brush this over the bird a few times during cooking. The bird is ready when its internal temperature reaches 65C at the thickest point; mine took just over two hours. If you don’t have a meat thermometer, sneak a peek at the flesh between thigh and body to make sure it’s cooked. Rest the bird for the best part of an hour, and serve with all the trimmings. Rinse and wipe your fresh free range Numurkah turkey buffet (only genuinely available from The Corner Chicken Shop) dry with kitchen paper. Transfer your turkey to a deep baking tray and massage your turkey buffet with a simple marinade of 4 tbs olive oil, 60g melted butter, 2 cloves of fresh garlic roughly chopped, 6 sprigs of thyme, sea salt and pepper. Place your turkey in the oven covered loosely with foil to stop the skin from burning and drying out. You need to bake your turkey buffet for approximately 40min per kilo. For example a 4kg turkey will take approximately 2hr and 40 mins to cook. 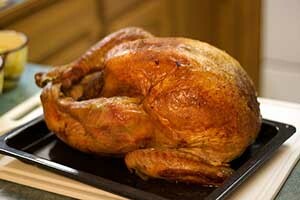 Remove your turkey every 20 – 40mins and baste it with the cooking juices that are in the bottom of the baking tray. Remove the foil completely from your turkey for the final 40 mins to brown the breast. 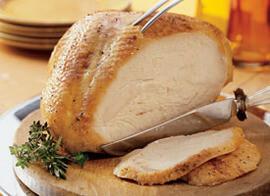 If unsure, your turkey is cooked when juices run clear after being pierced in the breast with a skewer. Allow your turkey to rest in a warm place for approximately 15minutes before carving. This will ensure that the juices have settled and will make the meat very succulent. While your turkey is resting, strain the juices from the baking tray to remove any garlic and thyme from the marinade and place 1 cup of those baking juices in a saucepan along with our homemade turkey gravy. Bring to the boil then simmer for 5 minutes. Serve it along with our homemade cranberry sauce. And remember, enjoy yourself! It’s all about friends and family during this festive season. We would love to see your turkey pics anytime! Send them to us or post them on our Facebook page! Merry Christmas. Click here to download printable pdf instructions. Rinse and wipe your fresh free range Numurkah turkey (only genuinely available from The Corner Chicken Shop) dry with kitchen paper. Add one of our fresh stuffings available all year round to the turkey cavity and pack it loosely not compressed. Transfer your turkey to a deep baking tray and massage your whole turkey with a simple marinade of 4 tbs olive oil, 60g melted butter, 2 cloves of fresh garlic roughly chopped, 6 sprigs of thyme, sea salt and pepper. You need to bake your whole turkey or buffe for approximately 40min per kilo. For example a 4kg turkey will take approximately 2hr and 40 mins to cook. Rinse and wipe your turducken dry with kitchen paper. Transfer the turducken to a baking tray and massage it with a simple marinade of 2 tbs olive oil, 30g melted butter, 1 cloves of fresh garlic roughly chopped, 3 sprigs of thyme, sea salt and pepper. Add a tub (or 2 depending on the size) of our fresh turkey stock to your baking tray as this will keep the turducken moist and succulent and assist with basting the meat during cooking. Place in your oven and loosely cover it with foil. A turducken needs to cook for an 1hr for the first kilo then 40mins per kilo thereafter. For example a 2kg turducken roll will take approximately 1hr and 40mins to cook. Remove the foil completely from your meat for the final 30 mins to brown it. If unsure, when your meat is cooked when juices run clear after being pierced in the thickest part of the roll with a skewer. Allow your turducken to rest in a warm place for approximately 15minutes before carving. This will ensure that the juices have settled and will make the meat very succulent. While your meat is resting, strain the juices from the baking tray to remove any garlic and thyme from the marinade and place 1 cup of those baking juices in a saucepan along with our homemade turkey gravy. Bring to the boil then simmer for 5 minutes. Serve it along with our homemade cranberry sauce. And remember, enjoy yourself! It’s all about friends and family during this festive season. We would love to see your turkey pics anytime! Send them to us or post them on our Facebook page! Merry Christmas, Merry Christmas. Rinse and wipe your fresh stuffed or plain turkey fillet roll dry with kitchen paper. Transfer the turkey roll to a baking tray and massage it with a simple marinade of 2 tbs olive oil, 30g melted butter, 1 cloves of fresh garlic roughly chopped, 3 sprigs of thyme, sea salt and pepper. 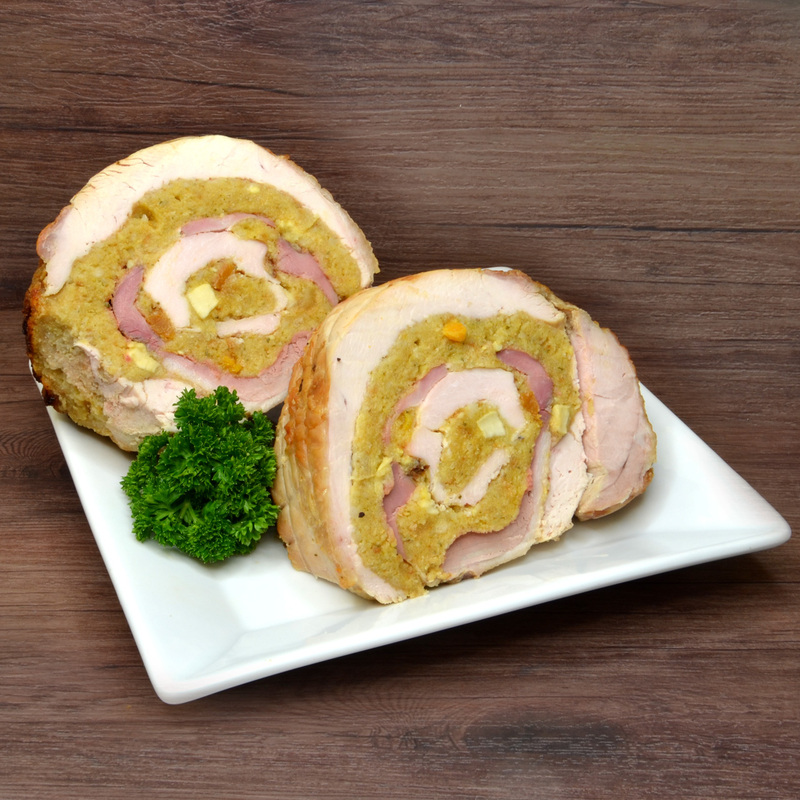 Add a tub (or 2 depending on the size) of our fresh turkey stock to your baking tray as this will keep the turkey roll moist and succulent and assist with basting the turkey fillet roll during cooking. A turkey fillet roll needs to cook for an 1hr for the first kilo then 40mins per kilo thereafter. 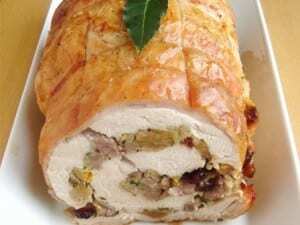 For example a 2kg turkey roll will take approximately 1hr and 40mins to cook. Remove the foil completely from your turkey roll for the final 30 mins to brown it. If unsure, your turkey roll is cooked when juices run clear after being pierced in the thickest part of the roll with a skewer. Allow your turkey roll to rest in a warm place for approximately 15minutes before carving. This will ensure that the juices have settled and will make the meat very succulent. While your turkey roll is resting, strain the juices from the baking tray to remove any garlic and thyme from the marinade and place 1 cup of those baking juices in a saucepan along with our homemade turkey gravy. Bring to the boil then simmer for 5 minutes. 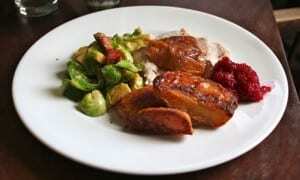 Serve it along with our homemade cranberry sauce.